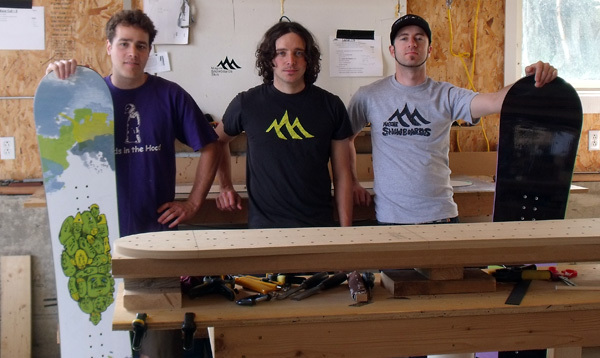 Magine Snowboards and Skis have developed a biocomposite snowboard using Composites Evolution's Biotex flax fabric. The novel construction includes a wooden laminate core, sandwiched between two layers of Biotex flax fabric, and a top and bottom plastic layer, all bonded together using an eco-epoxy resin system. Magine, who are based in Newfoundland, Canada, were looking to develop a product in keeping with their core values - freedom of expression, good times and support of the snow sports community - whilst differentiating themselves in the market place. Magine had been working towards developing a bio-fibre composite snowboard through a working partnership with the Composite Innovation Center in Winnipeg (CIC), the Natural Sciences and Engineering Research Council of Canada (NSERC), and the University of Winnipeg (UoW). It was through this relationship that Magine was introduced to Composites Evolution at the end of 2011. After extensive testing and research with the help of CIC, NSERC and UoW, Magine selected Biotex for its favourable properties. Prototypes were tested in house, developing a flex profile and comparing to current models and, after six months of development, the snowboard was finally tested on snow, at a local ski hill in Western Newfoundland. "The initial test was so successful that our team rider – Josh Keough – didn’t want to give up the prototype" Wheeler explained. "The bio-fibre snowboard responds, flexes and edges well. Its flex pattern and light-weight make it very comparable to freestyle snowboards for grinds and aerial manoeuvres. With the incorporation of the bio-fibre composite material, it stands above many snowboards on the market as a more sustainable product compared to fibreglass and basalt composite snowboards." Composites Evolution is a supplier of innovative, sustainable materials to the composites industry, including Biotex high-performance natural composites. Their product lines include fibres, resins and intermediates based on natural, bio-derived, recycled and recyclable feedstocks, which enable customers to meet cost, weight and environmental targets. Biotex natural reinforcements and intermediates provide the high performance and easy processing normally associated with glass fibre composites but with lower weight and environmental impact. They are suitable for semi-structural and decorative applications in sectors such as automotive, construction, marine, sports and consumer goods. Biotex uses a unique Twistless Technology to ensure a high degree of fibre alignment and performance. Standard materials include Flax, commingled Flax/PLA and commingled Flax/PP (others available on request) in formats including yarns, fabrics (woven and non-crimp) and preconsolidated sheets.